Vertebral Artery Dissection (VAD) refers to a non-hemorrhagic cerebrovascular event caused by a flap-like tear in the vertebral arteries of the cervical vasculature. VAD events along with carotid artery dissection (CAD) are generally spontaneous and are among the more common causes of ischemic stroke in the younger patient population.1 The clinical sequelae of VADs follow that of posterior circulation infarctions. Signs and symptoms can range from vision loss to dysphagia.2 We present the case of a patient who underwent a lumbar laminectomy at an outside hospital, and five days later presented to our institution with hoarseness. He was later found to have a left VAD. The patient is a 64-year old man who initially presented to our emergency room (ER) from his neurologist’s office with a chief complaint of worsening hoarseness. He has a past medical history of hypertension, hypercholesterolemia, and restless legs syndrome. 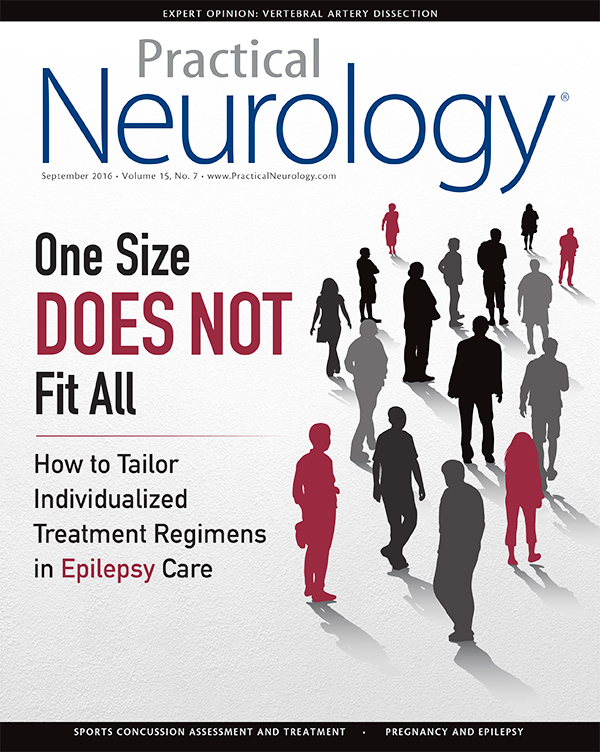 The patient denied any other complaint—no headaches, diplopia, weakness, dizziness, dysphagia, odynophagia, nausea, vomiting, slurred speech, or focal weakness. His vitals and lab results were unremarkable. Physical exam was only significant for voice hoarseness and a slight right pronator drift. The rest of his exam was otherwise normal. Figure 1a - MRI Diffusion images restricted diffusion within the right middle cerebellar peduncle, left brainstem and left thalamus (A). MRI TOF source images demonstrate an intimal flap (B). MRA TOF images demonstrate focal area of aneurysmal dilatation of the left V4 segment suspicious for dissection pseudoaneurysm (C). Prior to his presentation, the patient had undergone a lumbar laminectomy approximately 45 days prior. Five days after the procedure, the patient noticed his voice was changing; it was slowly becoming more hoarse. The patient had undergone outpatient otolaryngology evaluation from two different surgeons for his hoarseness. After laryngoscopic evaluation, the patient was found to have vocal cord paralysis. Electromyography later confirmed that he had 20 percent activity of his left cricothyroid muscle (innervated by the superior laryngeal nerve) and 20 percent activity of his left posterior cricothyroid muscle (innervated by the recurrent laryngeal nerve). The patient’s right side was normal. Subsequent neuroimaging via magnetic resonance imaging and angiography (MRI/MRA) revealed a dissection of the intracranial left vertebral artery, as well as multiple small acute/subacute embolic ischemic strokes of the posterior circulation—right inferior cerebellar peduncle, left midbrain, and left thalamic regions (Figure 1). The suggestion of brain stem infarctions by MRI led to the recommendation of emergent CTA imaging for further characterization of the cervical and intracranial vasculature with possible intervention. Figure 2. Left VA Pre-Stent (A). Left VA post-stent (B). Figure 3. Left VA 2 months later (A). Non-invasive Optimal Vessel analysis (NOVA) demonstrates antegrade flow in the left vertebral artery status post stenting (B). The patient was admitted to a telemetry unit for neuroendovascular treatment. A CTA of the head and neck confirmed the dissection of the intracranial left vertebral artery without other neurovascular pathology. The patient was aspirin and plavix loaded the night before his procedure. The next day he had undergone femoral cerebral angiography and intracranial stenting of the left vertebral artery (Figure 2a & 2b). The procedure and recovery were uneventful. A follow up MRI/A two months later showed flow within the stent. 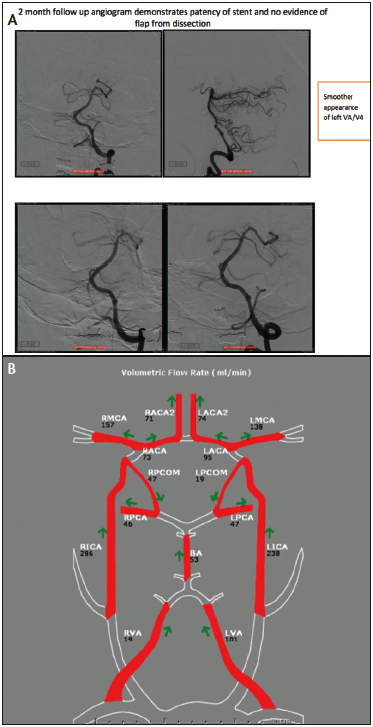 NOVA blood flow analysis demonstrated antegrade flow in the left vertebral artery and the basilar artery with no residual pseudoaneurysm (Figure 3). A follow-up EMG performed two months from the initial exam showed 60 percent function of his left-sided cricothyroid and posterior cricothyroid muscles. Clinically, the patient has near 100 percent recovery from his hoarseness. Although there are two vertebral arteries, the left vertebral artery typically dominates with regards to blood flow delivery to the brain.4 The relative sizes of the vertebral arteries vary considerably, and in approximately 10 percent of cases, one vessel is so small that the other is essentially the only artery of supply to the brainstem. In the latter cases, if there is no collateral flow from the carotid system via the circle of Willis, occlusion of the one functional vertebral artery is equivalent to occlusion of the basilar artery. What makes our patient unique is that after his lumbar laminectomy he presented with the isolated symptom of hoarseness, which suggests that the vascular territory affected was in the issuing fibers of cranial nerves nine and ten.3 The proposed mechanism of injury is likely a spontaneous dissection of his V4 segment, as there was no direct alteration to the cervical spine either via manipulation therapy or trauma. Kevin G. Lazo, DO is in the Department of Medicine, Northwell Health Lenox Hill Hospital in New York. Sanjeev Sharma, MD is in the Department of Medicine, Northwell Health Lenox Hill Hospital in New York. Oki Ishikawa, MD is in the Department of Medicine, Northwell Health Lenox Hill Hospital in New York. Guillermo Restrepo, PA-C is a Senior Physician Assistant in the Division of Neurosurgery and Neuroendovascular Surgery at Lenox Hill Hospital in New York. Jessica Lim, MD is an Otolaryngologist at Lenox Hill Hospital in New York. Bidyut Pramanik, MD is Chief of Neuroradiology at Lenox Hill Hospital in New York. Jane A Lee, MD is a Neuroradiologist at Lenox Hill Hospital in New York. David Langer, MD is a Professor of Neurosurgery at Hofstra Northwell School of Medicine, and Chairman of Neurosurgery at Lenox Hill Hospital. Steven Mandel MD, PC is a Clinical Professor of Neurology at Lenox Hill Hospital, Hofstra Northwell School of Medicine. Rafael A Ortiz, MD is Chief of Neuroendovascular Surgery and Interventional Neuroradiology & Neurosurgery at Lenox Hill Hospital. 1. Mokri B, Houser OW, Sandok BA, Piepgras DG. Spontaneous dissections of the vertebral arteries. Neurology. 1988;38:880–885. 2. Arnold M, Bousser MG, Fahrni G, Fischer U, Georgiadis D, Gandjour J, Benninger D, Sturzenegger M, Mattle HP, Baumgartner RW. Vertebral Artery Dissection: Presenting Findings and Predictors of Outcome. Stroke. 2006;37:2499-2503. 3. Smith WS, Johnston S, Hemphill J, III. Cerebrovascular Diseases. In: Kasper D, Fauci A, Hauser S, Longo D, Jameson J, Loscalzo J. eds. Harrison’s Principles of Internal Medicine, 19e. New York, NY: McGraw-Hill; 2015.http://accessmedicine.mhmedical.com/content.aspx?bookid=1130&Sectionid=79755261. Accessed July 24, 2016. 5. Saeed AB1, Shuaib A, Al-Sulaiti G, Emery D.Vertebral artery dissection: warning symptoms, clinical features and prognosis in 26 patients. Can J Neurol Sci. 2000 Nov;27(4):292-6. 7. Park KW, Park JS, Hwang SC, Im SB, Shin WH, Kim BT. Vertebral Artery Dissection : Natural History, Clinical Features and Therapeutic Considerations. J Korean Neurosurg Soc. 2008 Sep;44(3):109-115. 8. Pham MH, Rahme RJ, Arnaout O, et al.. Endovascular stenting of extracranial carotid and vertebral artery dissections: a systematic review of the literature. Neurosurgery 2011;68:856-66. 9. Yen JC, Chan L, Lai YJ. 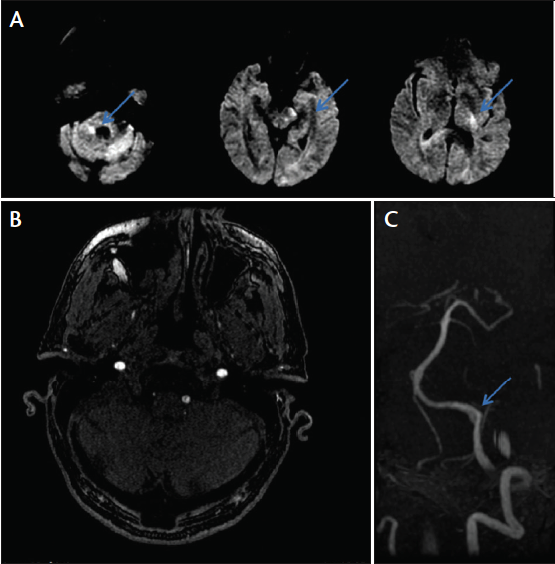 Vertebral artery dissection presented as lateral medullary syndrome in a patient with migraine: a case report. Acta Neurol Taiwan. 2010 Dec;19(4):275-80. 10. Leppert D, Radue EW. Medial medullary syndrome due to vertebral artery dissection. J Neurol Neurosurg Psychiatry. 2001 Jan;70(1):130-1. 12. Mustanoja S, Metso TM, Putaala J, Heikkinen N, Haapaniemi E, Salonen, O, and Tatlisumak T. Helsinki experience on nonvitamin K oral anticoagulants for treating cervical artery dissection. Brain Behav. 2015 Aug; 5(8): e00349.